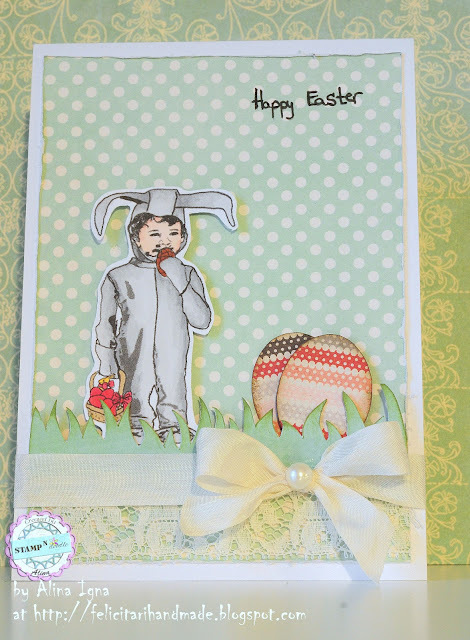 This week at Stamp'n'doodle Challenge it's Easter time. I don't celebrate Easter till 5th of May - the Orthodox Easter, but it's never to early to share a holiday card. In aceasta saptamana la provocarea Stamp'n'Doodle e timpul pentru Pasti. Eu nu sarbatoresc Pastele pana in 5 mai - Pastele Ortodox, dar niciodata nu e prea devreme pentru o felicitare de sarbatoare. 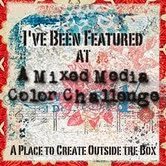 Hope to see your creations linked in the challenge. Sper sa va vad creatiile cu aceasta tema. Yes! Now I have a bookmark addiction! They are so easy to make! Let me tell you step by step. Da! Acum am o manie pentru semne de carte! Sunt atat de usor de facut! Dati-mi voie sa va arat pas cu pas. 1. Choose a stamp. 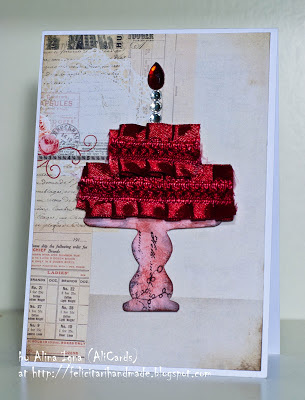 I chose this beautiful digi stamp from Tiddly Inks. Alegeti stampila. Eu am ales aceasta stampila minunata de la Tiddly Inks. 2. Color it! You can use this coloring tutorial. Coloreaz-o! Poti folosi tutorialul de colorat de aici. 3. Cut on the edges. Decupoaza cu grija pe margini. 4. Cut a 10x13 cm of cardstock. Taie o bucata de hartie mai groasa la dimensiunea de 10x13 cm. 5. Fold it in a triangle with the top on the side that has 13 cm. Impatur-o in forma de triunghi cu varful pe latura de 13 cm. 6. Measure the triangle and cut one a little bit smaller from another design paper. Masoara triunghiul si taie unul similar dar putin mai mic dintr-o alta hartie cu design. 7. For an older look, distress the edges. 8. Using double sided paper, stick the second triangle on the first one. Folosind banda dublu adeziva lipeste-l peste primul triungi. 9. Cut the unfolded edge with the diecut of your choice. 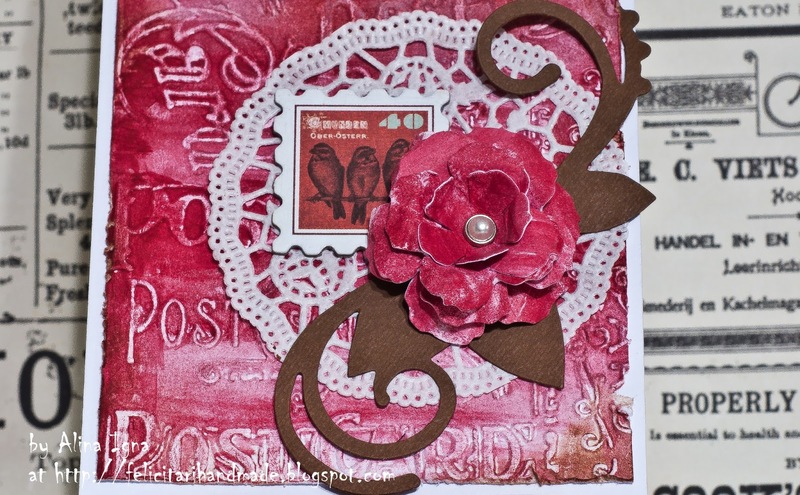 I used here Tim Holtz Brackets Die. Taie partea neimpaturita cu ce matrita doresti. Eu am folosit Tim Holtz Brackets Die. 10. Diecut 2 circles of slightly different sizes. I used 2 kinds of scalloped circles. Taie doua cercuri de dimensiuni diferite. Eu am folosit doua cercuri dantelate. 11. Stick the 2 circles together using pop dots. 12. Using pop dots stick the circles to the base. Folosind aceeasi banda, lipeste cercurile la baza. 13. Add the stamp to the base, add alphabet stickers and there it is. 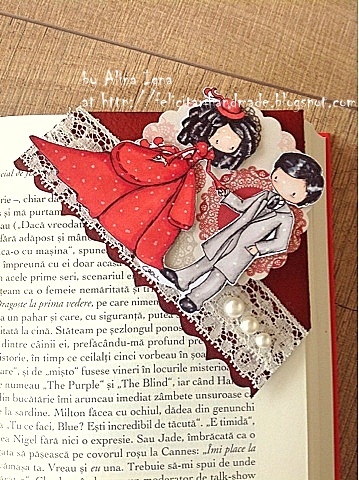 Your custom made bookmark. Lipeste stampila peste baza, adauga litere autoadezive si semnul de carte e gata. I'm linking this to the Tiddly Inks Anything But A Card Challenge. Hope you enjoyed my tutorial! Happy reading! Sper ca v-a placut tutorialul! Spor la citit! Am primit de la Sorana doua premii dedicate blogurilor micute. Scopul este de a le face cunoscute cat mai multor oameni. Multumesc mult Sorana!. - anuntati-i pe cei nominalizati de voi, pentru ca ei sa-si poata lua premiul acordat. Today I have a super quick post for you 'cause it's Sunday and the meal is boiling in the kitchen (*wink*). Do you remember the coloring tutorial that I presented at the end of February? Well... I've finally used that image on something and that something is a bookmark. Azi am pentru voi un post foarte scurt pentru ca e duminica si mancarea fierbe in bucatarie. Va amintiti de tutorialul de colorat pe care l-am prezentat in februarie? In sfarsit am folosit acea imagine la ceva si acel ceva este un semn de carte. I am entering this bookmark to Tiddly Inks Anything But A Card Challenge. Inscriu acest semn de carte la provocarea celor de la Tiddliy Inks. Doua postari in aceeasi zi, doua zile la rand... Aceasta este o minune si nu se intampla prea des. Eu totusi sper ca se va intampla mai des. Yesterday I was in the mood for some crafting so I decided to use this lovely chevron sheet of paper together with some stamps from the Unity January KOTM. Since I'm using chevron pattern I will enter the card for the Moxie Fab Wold Chevron Challenge. Ieri am avut inspiratie pentru lucru manual asa ca am decis sa folosesc aceast model de hartie impreuna cu cateva stampile din kitul de ianuarie de la Unity Stamps. Pentru ca folosesc acest model de hartie, voi inscrie aceasta felicitare la provocarea Moxie Fab Wold Chevron. For quite some time now I've started to alter an art journal and now I reached the desired form. The fact is that this cover was done and redone for 2 times till I reached the final result. De ceva vreme incoace am inceput lucrul la infrumusetarea acestui jurnal iar acum am ajuns la forma dorita. Adevarul este ca am facut si refacut aceasta coperta de 2 ori. 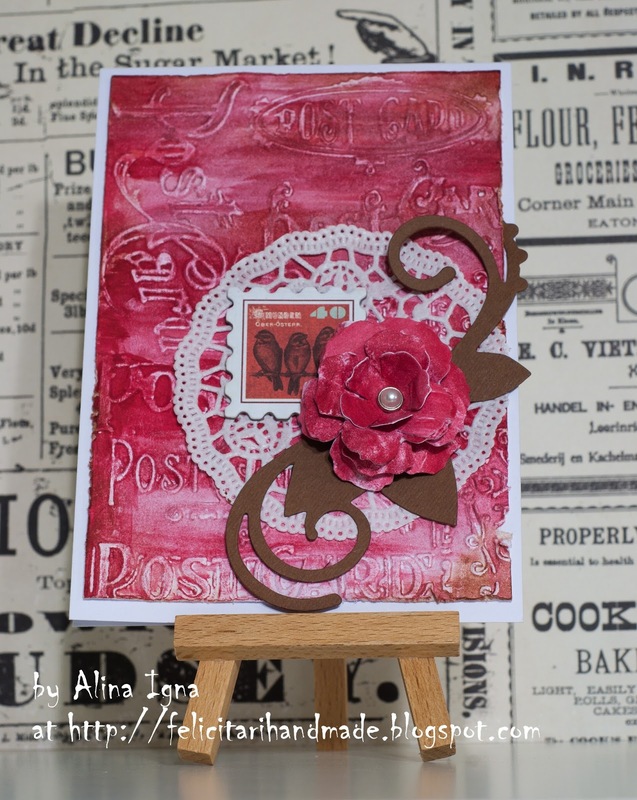 The sentiment is from Unity Stamps, the metal embellishments are from Stamperia, the ribbon is from Ribbon Carousel Shop and the flowers... I don't know. I wanna enter this journal to the Ribbon Carousel Challenge. 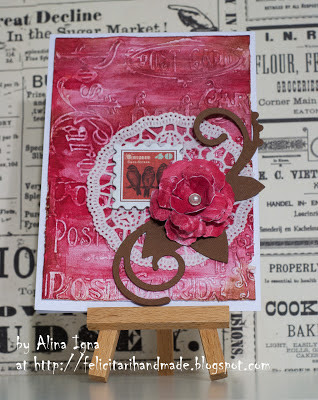 Stamp'n'doodle challenge - Anything Goes!!! 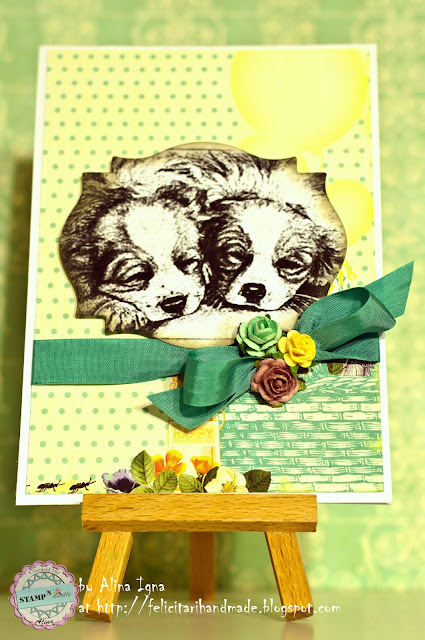 This is my very first post as a Stamp'n'doodle Design Team member. Welcome to our challenge. Today - Anything Goes! Below you have my sample for the challenge - guess what? - it's a card! Aceasta este prima mea postare ca membru al echipei de design Stamp'n'doodle. Bine ati venit la provocarea noasta. Astazi - orice se potriveste! Mai jos aveti mostra mea pentru provocare - ghiciti ce este? - e o felicitare! For this card I used a sweet puppies stamp from Stamp'n'doodle. Pentru aceasta felicitare am folosit o stampila draguta cu catelusi de la Stamp'n'doodle. Moxie Fab World is having a challenge with the theme Spring Home Decor. So I thought I give it a try. 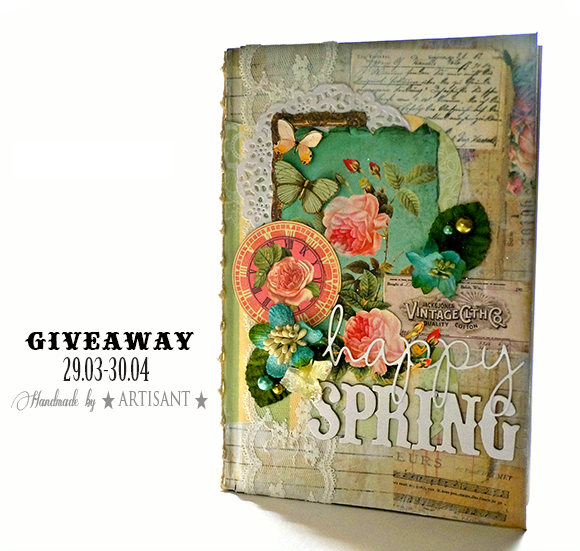 I combined it with Tim Holtz Tattered Floral challenge. Moxie Fab Wold are o provocare cu tema decor de primavara la care m-am hotarat sa particip. Am combinat aceasta provocare cu cea a lui Tim Holtz. First I painted a white sheet of paper with red food coloring and than diecut it into pieces. Pentru inceput am colorat o coala alba cu colorant alimentar rosu, diluat cu apa dupa care am taiat hartia folosind Tattered Floral Die. I assembled the flowers and glued them on sticks. I attached some felt leafs and arranged them in a small flower pot. I thought it would be a great Easter decor so I die cut a bunny also. Am asamblat florile si le-am lipit pe bete. Am atasat frunze din fetru si le-am aranjat intr-un ghiveci mic. M-am gandit ca ar fi un decor frumos de Pasti asa ca am decupat si un ieputas. Now the Easter decor is ready to be put on your Easter table or anywhere you like. Acum decorul de Pasti e gata sa fie pus pe masa de Pasti sau in orice parte a casei doresti. I have a big news to share with you today! I am one of the new design team members for Stamp'n'doodle. Yupiii! I am very excited for the new adventure it the crafting world. Pentru azi am sa va spun o veste foarte frumoasa! Sunt una din noile membre ale echipei de design ale Stamp'n'doodle. Yupiii! Sunt foarte incantata de aceasta noua aventura din lumea handmade. 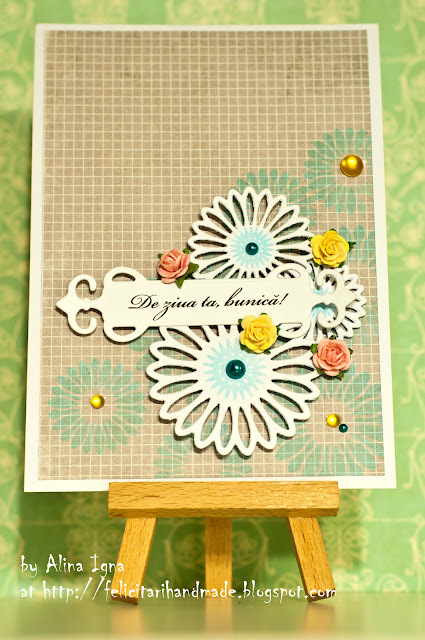 Every Wednesday a new challenge will be posted on the Stamp'n'doodle blog! I will also have a sample prepared for it. Hope to see your creation there! In fiecare miercuri o noua provocare va fi lansata pe blogul Stamp'n'doodle! Voi avea si eu o mostra pentru provocare. Sper sa va vad creatiile acolo! I know 8th of march is far away now, but I just couldn't help myself not to show you this card I did for a granny. Stiu ca 8 martie a trecut deja, dar nu m-am putut abtine sa nu va arat aceasta felicitare pe care am facut-o pentru o bunica. I printed the sentiment myself and cut it with Spellbinders Fancy Tags dies. The flowers were cut with Sizzix Framelits dies. 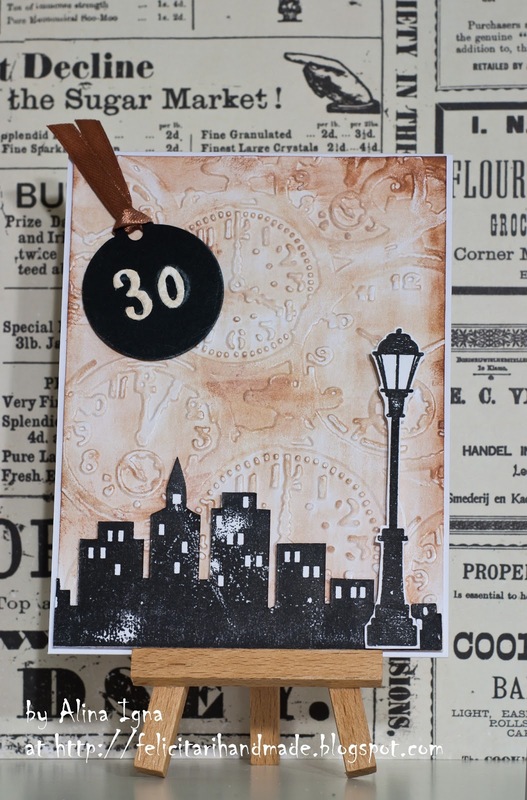 Also the background is stamped with stamps from the same pack as the Sizzix dies. Mesajul l-am printat si l-am taiat folosind Spellbinders Fancy Tags, florile sunt taiate cu Sizzix Framelits, iar fundalul l-am stampilat cu stampile din acelasi set de la Sizzix. Good morning all! Are you waiting for the spring? I sure am! Buna dimineata tuturor! Asteptati cu nerabdare primavara? Eu sigur o astept! 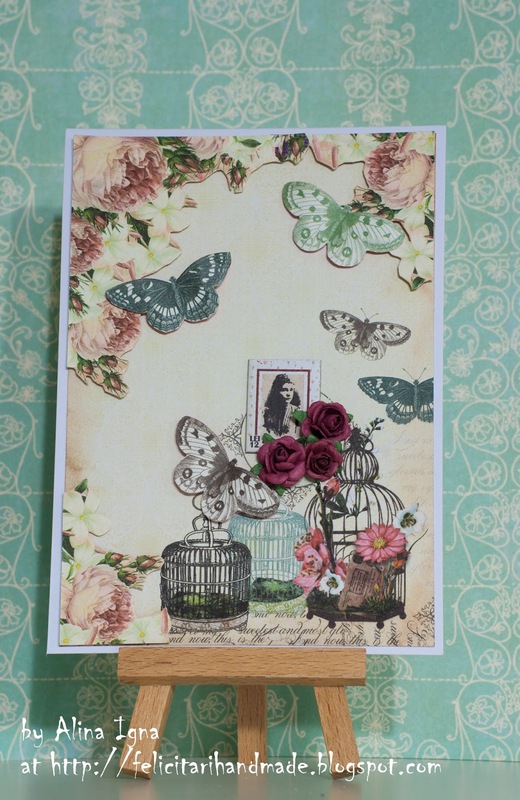 For today I wanna share with you a card that celebrates spring, flowers and butterflies. Inspiration came from here. Pentru azi doresc sa va arat o felicitare care celebreaza primavara, florile si fluturii. Inspiratia a venit de aici. 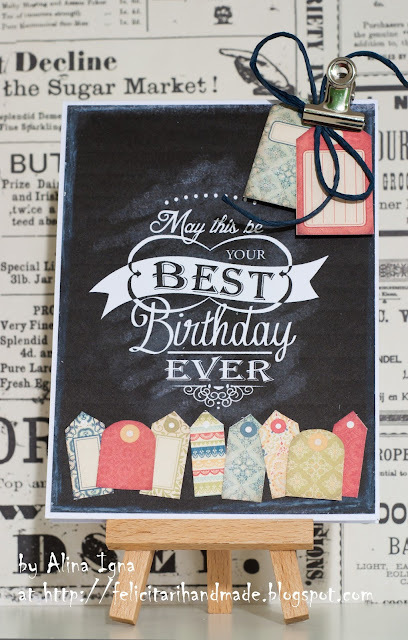 Today I want to share with you the second card I made for the birthday boy. Azi doresc sa va arat cea de-a doua felicitare pe care am facut-o pentru sarbatorit. I want to enter this card to the Lawnscaping Challenge. On Saturday, Laura's great husband turned 30. This had to be celebrated in a great manner so their good friend DJ asked me to make 2 greeting cards for him. Today I will show you the first card I made. Sambata, sotul Laurei a implinit frumoasa varsta de 30 de ani. Acest eveniment a trebuit sarbatorit cu mare fast asa ca bunul lor prieten DJ m-a rugat sa creez 2 felicitari. Azi va prezint prima dintre ele. For this card I printed out the free sentiment from Paper Crafts. 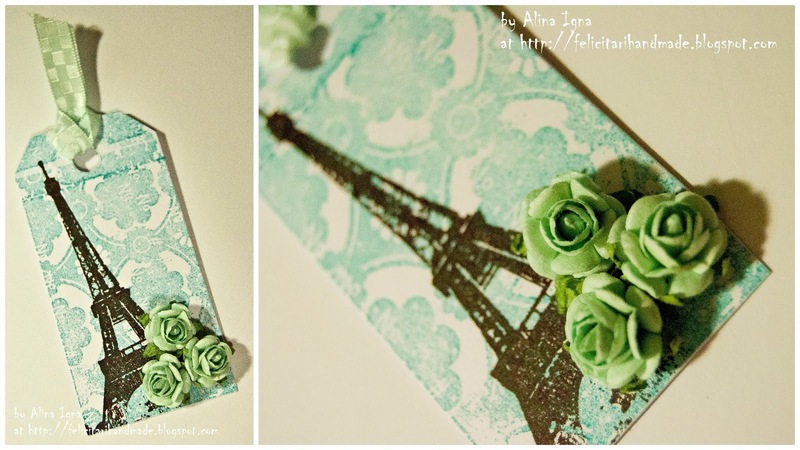 Pentru aceasta felicitare am printat sentimentul pus la dispozitie de catre Paper Crafts. 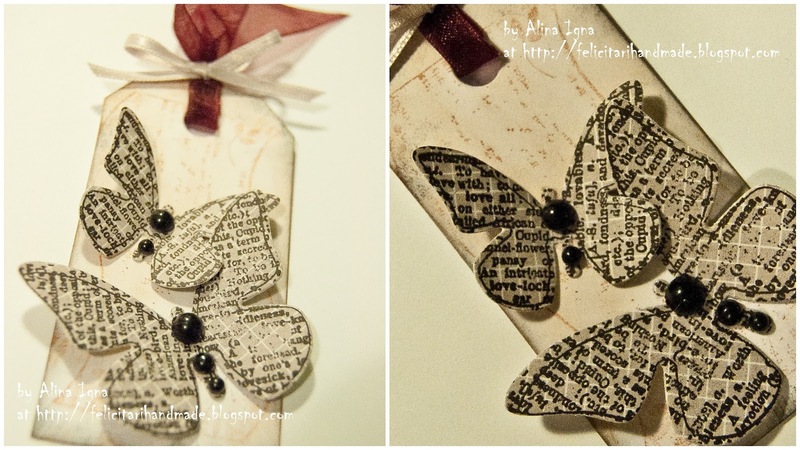 Today I will show you some tags I made to embellish the gifts that my mother, my grandma and my future mother in law received for Mother's Day. Astazi va voi prezenta etichetele pe care le-am realizat pentru a accesoriza cadourile pe care mama, bunica si soacra le-au primit de Ziua Mamei. The first tag was for my mother. Prima eticheta a fost pentru mama. This second tag was for my grandma. Aceasta a doua eticheta a fost pentru bunica. And last but not least, this second tag was for my future mother in law. Si nu in ultimul rand, aceasta a treia eticheta a fost pentru viitoarea mea soacra. Have a great week-end! I'm off finding the perfect wedding dress! Sa aveti un weekend minunat! Eu am plecat sa-mi gasesc rochia perfecta! Happy Mother's Day to everyone who celebrates this special Holiday today! 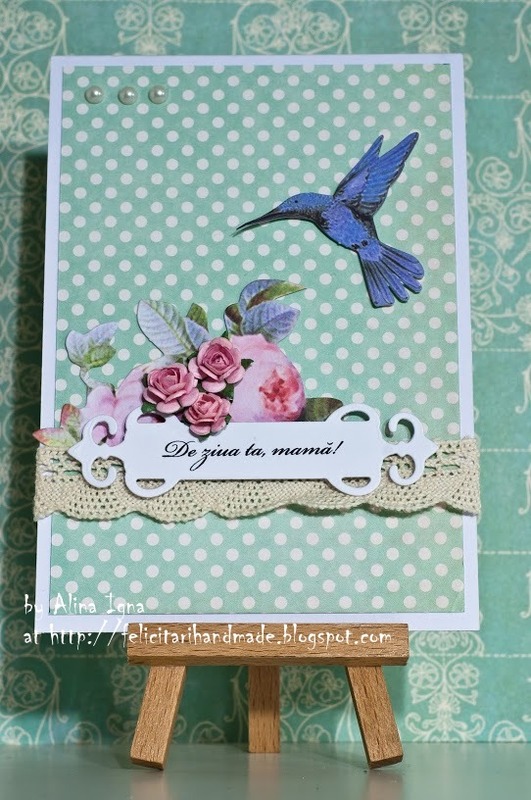 Here in Romania we celebrate it today, on 8th of March, so today I will share with you a special card for a mother. La multi ani de ziua mamei! Sa aveti o zi minunata si plina de iubire! Pentru ca astazi sarbatorim Ziua Mamei m-am hotarat sa impart cu voi aceasta felicitare facuta pentru o mama. I am entering this card to Creative Creations Challenge and to Songbird Challenges. 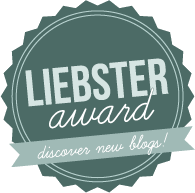 Recently someone in the blog land said: "it's to bad that people don't usually do bilingual blogs when they have this possibility". 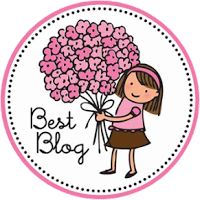 So I decided that starting today my blog will be written in English as well as in Romanian. What do you think? I hope my Romanian visitors will be thrilled about this change. For me it will be harder since I have to write twice, but I think I will manage it. Recent cineva pe un blog a spus: "pacat ca blogg-erii nu isi scriu blogurile in doua limbi daca au aceasta posibilitate". Acest lucru m-a pus pe ganduri si m-am hotarat ca incepand de azi sa va scriu si in limba romana, pe langa limba engleza. Ce ziceti? Sper ca voi, vizitatorii romani, sa fiti incantati de aceasta schimbare. Pentru mine va fi putin mai greu pentru ca trebuie sa scriu de doua ori, dar sunt singura ca ma voi descurca. 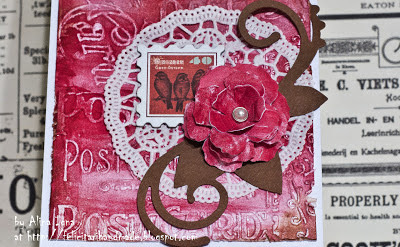 Today I will show you a card made for the tattered flowers challenge that is going on at Tim Holtz blog. Here is a close-up on the flower. It is very easy to make and I think they look very cute. I'll share the tutorial later this month. 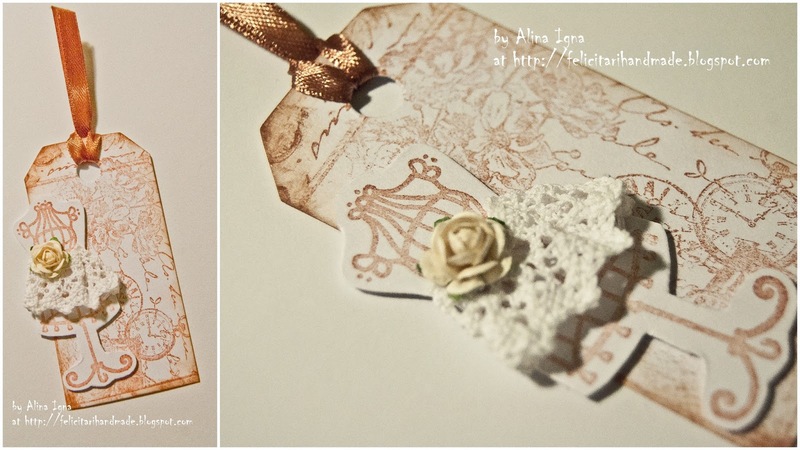 Pentru azi am sa va prezint o felicitare facuta pentru concursul tattered flowers pe care Tim Holtz il gazduieste. Aici aveti un detaliu al florii facute utilizand matrita Tattered Flowers de la Sizzix. Este foarte usor sa creezi o astfel de floare. Am sa va impartasesc tutorialul luna aceasta. For the background I used Anna-Karin's tutorial that you can find here, but with a slightly change: I used acrylics instead of Distress inks. Pentru designul de fundal am utilizat tutorialul Annei-Karin care poate fi gasit aici. Eu l-am modificat putin si am folosit culori acrilice in loc de Distress inks. In January I was one of the lucky winners who won the 75 Creative Card Challenges magazine from PaperCrafts and I was very happy about it. Somewhere in the magazine there was a card with a birthday cake made out of ribbon so I tried my best to case it. The cake stand is not a diecut, I made it myself ;).